Liad Goldsmith is the owner of GUX™ studio based in Tel-Aviv, Israel and is an expert UI/UX designer for mobile, desktop and web. She will be talking about “Redesign Principles for Mobile UX” at the Conversion Conference in Berlin. We asked her some questions about UX Design in advance. Liad, have you ever been to Berlin or Germany? What are the things or places you are looking forward to the most regarding your trip to Germany? This is my first time in Berlin, so there are so many things I want to do! The Prenzlauer Berg as I heard is a young and hip neighborhood I want to visit, and it has good restaurants, too. Moreover, My grandfather is a holocaust survival and I have Jewish roots, so I want to visit the Jewish Museum of holocaust. I also know it is one of the most fascinating architecture sites in Berlin. As a fan of painting, illustration and graffiti another attraction of Berlin for me is The East Side Gallery Berlin which is the longest remaining of the famous wall and it has dozens of painting made by artists from around the world. It is intriguing for me because I understand it has the largest graffiti gallery in the whole world, and that some of its’ paintings are ones to document and represent the eastern residents’ hope for a better, free future for Europe. You have been working as a user experience expert for a long time – how did UX change in recent years? Once very few practiced the profession of being UX designers, and UX was used as a reinforcement player for achieving goals for only few products. For example recently after computers were invented – manufacturers used UX to help improve the design of computers so they would be more comfortable and “ergonomic” (healthier to use for many hours of use). Today it is a constantly evolving field which in fact has become a synonym for innovation and progress, and is at the core of almost every product. UX today helps make things such as technological advancement accessible to the public, some of these advancements are happening so fast and in such an accelerated manner, that it creates a complete different life standard and gives control to people as well as an improved life quality. Take for example the fact that up until a few years ago taking a video from a large height was not accessible nor affordable for every person. But today any drone can take photographs and high quality videos from heights people would never imagine they can access! You can basically take an example from another period in the history of human kind and apply it here and that’s the Renaissance period in Europe, an era in which there was a total revolution in terms of perception – god and the church were no longer placed in the center of life, but man or humanism has become its’ center, instead. Apply this perception to what’s happening today and you can see that in situations where UX used to solve problems solely, we have reached an an era in which UX is an inseparable part of almost any product. UX today places the users in the center of our own lives and it is not the province of just a few. 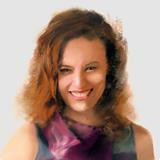 You are the owner of GUX™ studio which is based in Tel-Aviv, Israel. Is there a difference concerning UX in Israel compared to Europe (and especially Germany) or the US? As far as I managed to see there is no real big difference in terms of UX between Israel and other countries. One thing is that Israel focuses and comes up with a lot of products’ UX that deal with data theft from organizations, ransom ware or overall what’s called “Cyber Security”, which is disturbing and also becoming a more common phenomena the past years in many organizations. The industry of data security is very advanced here – because of the background of many of Israel’s entrepreneurs. I personally work with two Cyber companies, one in the field of advanced data security for mobile devices and the other in the field of detection of malware for big organizations. The work with them is very interesting and also different. The challenge in terms of UX is allowing huge amounts of data to the screens, but only the data that we can actually summarize and make accessible for users who are constantly “flooded” with information from various systems they work with, so they can grasp it in a clear and simple way. The title of your session is “Redesign principles for Mobile UX” – can you please tell us what is most important when redesigning mobile interfaces? The year of 2016 was defined by many as “The year of the battle for attention” – In which many businesses’ goal is to bring users to their service or product for the first time, as well as turn users to returning users, who come back for more, again and again. In order to be able to overcome the difficult competition that stands before the owners of products there are a few redesign principals you should pay attention to when designing user interfaces. Like doubting the foundations, because mostly the usual tendency is to stick to the design that exists or to an already developed interface and this is not what the customer hoped for when approaching a designer for a redesign. Or using a metaphor for the interface, which means that you search for a motif from the domain of the product or service and then place it in the interface. In a redesign project the studio made for a mobile app in the domain of deliveries, the founders noticed that it is very functional and wanted to add more of a shopping experience. The motif we used was a human package which made the app more approachable and pleasant. There are more principals of redesign but I’ll focus on the ones that are unique for mobile, which is the topic of my lecture. One principal is adding value for the users. When I am facing a redesign challenge for mobile, I always think how I can provide more value in such little space, more than the user had before. For example, on the redesign we did for the app I mentioned before – we added a map that didn’t exist before, that showed the user exactly where their package is located at any given time from the moment they order, and also gave the user a sense of “control”. From a solely “functional” app we turned it into an app that gives more added value. It’s worthwhile to notice that some solutions we use to give more value for users are not always practical for a desktop app. For example – the map – is not a solution we would offer for a desktop app because of the dependency on the component of the location meant for mobile mostly and refers to the mobility of the user. That’s why you won’t see a lot of desktop apps using maps so much because there are suitable for users who are either on the go or are interested on tracking the position of a certain object. You wrote the first guide for designers and developers working alongside. That sounds great because we all now that there are sometimes (more or less) differences between designers and developers. Can you please let the cat out of the bag for us and tell us the secret for a good teamwork between designers and developers? I’ll answer the question with a few examples. In the 8 years I’ve worked with hundreds of programmers and designers, and me & my colleagues came across a few problems that repeated themselves in the shared work with programmers. The guide is based on these cases, and in it I describe a method I developed for working together which I apply in my work. The outcome of this is that we design interfaces with speed – within just 2-3 months, with nearly no fixes, programming in pixel-perfect level, meaning the developed interface looks just as designed and planned. UX before programming (not parallel or after). Mostly, the designer joins at a very late stage of development of the product without the designer around to give their emphasis for the experience of use in the product. This is a timing where you can no longer change the code and even if the designer wants to fix something they can’t. Recently it also happened to me with one of the companies I work with, when I joined the team while they were already starting to work on the product’s code. Because I worked parallel to the programmer, he didn’t really have time to implement the UX changed, so we had to postpone the UX changes to the next version. If I would have started earlier, before the programmer even started, the changes would have been implemented in that very same version so they users would have gotten the extra value as early as possible. Recognizing the technology limitations for the development: A colleague of mine found a new tool and in this tool, he designed a whole screen with its’ features already in code. The project took about a week of work, and the designer was ecstatic to hand it to the programmer! When the programmer received the code, he updated the designer that all he did was not practical because the code he got was written in the wrong way for the technology he was working with! In order to implement the design, the programmer needed to re-write it from scratch and that was not approved (naturally…) by the client. The programmer and designer were extremely frustrated and a week of work of the designer was wasted… This incident maybe more rare, a case in which a designer writes the code and hands it to the programmer but illustrates a more common scenario when the designer hands off the design and the programmers cannot implement it because of problems in the way technology limits the interface’s design. It happened more than once when I spoke to frustrated designers who invested days and weeks on special designed icons and the programmer denied these designs because they work with ready icon libraries and it is impossible to use something different than these libraries (this happens in Android for example). Aligning work methods and technologies at the beginning of the process can prevent wasted time, money and other valuable resources. Meetings held on a regular basis: Communication starts with a kick-off meeting in which we align and synch the way we are going to work together, align expectations in terms of technological limitations, time frames and schedule, and the deliverables the programmer expects to receive, like the types of files they will need, color definitions, type definitions, and more. The meetings and communication are done on a regular basis also after the kick-off meeting. Checklists: Before sending the delivery of files we make sure it meet the highest standard the programmers needs. Something I ran into all the time, is when designers finish to design and name the file of this design in a name only they understand like “icon_final”. This creates certain difficulty for the programmer as they don’t know their way around the graphic parts of the delivery and don’t know what does every file represent “defacto”, where should they place it in the code etc. What happens as a result is that the programmer have to get into each file that was sent, see which part it represents and rename it with a name that really describes it like registration_page_icon.png. This is not the work a programmer should have and it creates a lot of frustration for them. Working with style guides and specs: The programmer’s work is not simple – he need to code the design a designer created. If the designer doesn’t define it in an organized document (like spec or style guide) providing all the mathematical values of every graphic element of the interface, such as distance from the buttons to the edges of the screen, the colors on the screen, font sizes and so on, the programmer won’t know to develop the interface just like the designer planned. Not once nor twice I witnessed designers who don’t define those values for the programmers and then there is friction created between them. For example, a designer creates an icon for a topic on a mobile app. When a user clicks on this icon the user reaches a new screen related to that topic. This designer imagines a large area for the user to press bigger than the area of the defined icon, so that the user won’t have to make an effort to click precisely on the small icon, and will have a large comfortable area to click on. The designer doesn’t share that “imagination” in writing to the programmer and the programmer develops it in a way that only when clicking on that exact icon the user moves to the next screen as wanted, the designer is frustrated, the experience from using this screen is not pleasant and there is grounds for an argument between the programmer and the designer. Using a spec or a style guide can resolve and prevent such arguments. What do you think will be the trend for UI over the next few years? The first related to the adaptation of pictures to various dimension sizes. Because interfaces are going to have larger areas for interaction, for example the 360 degrees of the VR world, then the dimension of graphics are also going to grow, therefore photographs will grow beyond the familiar sizes and we may see even more change and evolution of the photography as a field. On the other hand, right now many companies are working on smaller interfaces like wearable devices. Therefore, there will have to be more flexibility when adapting the graphic designs from one interface size to another. If today we supply images of people or environments in PNG or JPG format, it is possible that the picture will be given as code so it is adaptable to changing resolutions and requirements of these different devices. Another development refers to available font kinds. Today not every font is suitable for web, mobile and desktop apps. Some fonts are suitable for use only in print designs (posters, brochures, physical magazines etc.). In the near future I expect the high standards of the print world to percolate into the digital world, therefore more beautiful, readable fonts will be available for use on web or mobile devices. Thank you very much for the interview, Liad! © 2019 Conversion Conference - Rising Media Ltd. All Rights Reserved. Google Analytics tracking ist deaktiviert. 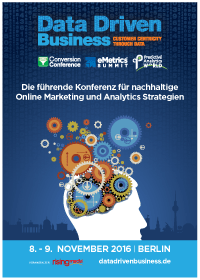 Das Tracken von Daten auf "https://conversionconference.de" durch die Rising Media Ltd. mittels Google Analytics wurde deaktiviert.